From the above given links, you will able to understand much more about the OSPF. This article is all about the basic configurations on router about the OSPF. Below is the basic topology of the OSPF which has not any relevance with the configuration part. The topology is just to show you what kind of network you have in the OSPF separated in the areas but with have one process id. There is no relevance of the IP addresses uses here with any of the live networks or with any of the enterprise networks. In Step 1, I am talking about how to enable the OSPF routing protocol on Cisco routers by putting the OSPF process id. Make sure you know about the process id, It is similar like AS number in the BGP but defines the OSPF instances, So if we have two process id's like OSPF 2 and OSPF 3, it clearly shows that these are two different networks. 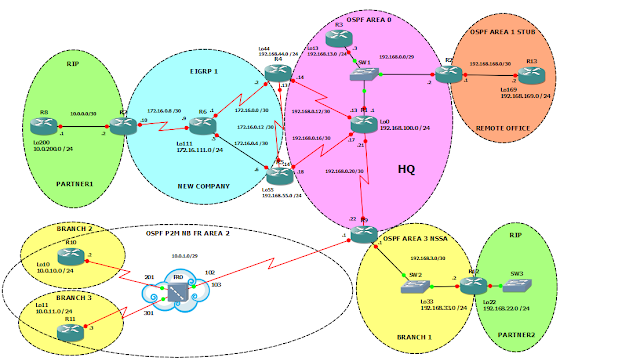 In Step 2, As i earlier said if there are two OSPF processes then the traffic flow will not be like the internal network and if you want to inject the traffic from one OSPF process id to another you need to re-distribute the routes similarly you redistributing the routes from IS-IS, BGP or EIGRP in OSPF domain. In Step 3, I am explaining about the OSPF interfaces parameters where you can configure the cost, priority, hello and dead interval timers, Authentication. All these parameters can be set by administrator and is not compulsory. In Step 4, I am talking about the OSPF area parameters where i can define the authentication and area types like you can configure the area as Stub area, NSSA area, Totally stubby area and so on. The authentication per interface and the authentication for the area differs. I explained authentication on interface in Step 3 and here you can configure the authentication on the OSPF process. In Step 5, It is just to configure the route calculation timers and show the log adjancey changes. Below is show OSPF commands will show you all the configuration you done with the OSPF process id.